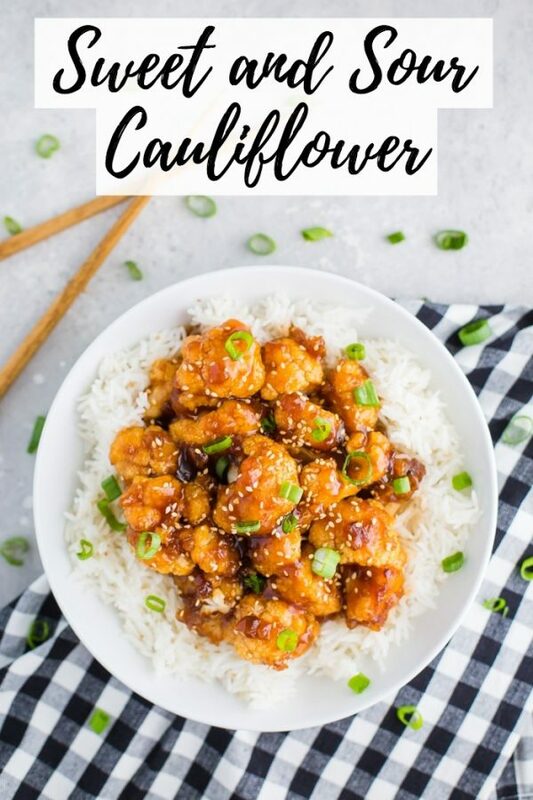 Sweet and Sour Cauliflower- an easy to make vegan meal that’s perfect to satisfy that sweet and sour chicken craving! A delicious vegan fake-out take-out weeknight dinner! GUYS! We leave for Europe one week from today and I’m FAR from ready. Trying to give priority to getting all of our client projects wrapped up before I squeeze in a little extra blog work and THEN finally get packed to go. We’re SO EXCITED! I’ve mentioned our trip on Instagram a few times. We’re flying in Rome where we’ll spend a few days before going to see family in Verona and then head to Venice for a couple days because we couldn’t not go. Then we’re taking a train through Switzerland, spending about 2 days in Zurich, before heading to Paris for a few days (!!!). We’ll wrap our trip up in southern England with a visit to Stephen’s grandmother. I know, I’m a bit exhausted just typing all of that out. BUT I CAN’T WAIT!!! 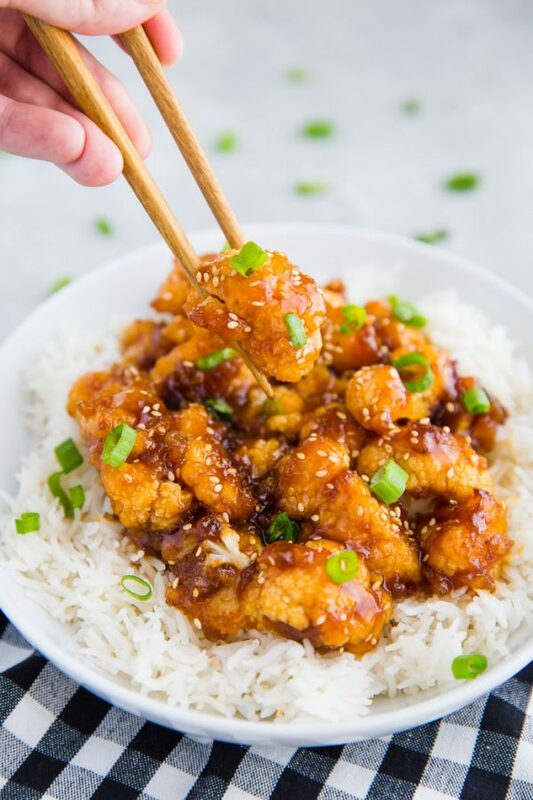 Let’s talk about this Sweet and Sour Cauliflower. 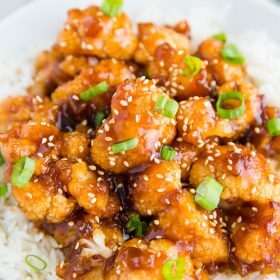 I may or may not have wanted to do this recipe largely just so I could say “sweet and sour cauliflower” over and over again 😂. Sweet and sour chicken was always my go to dish when ordering take out. Basically every. single. time. growing up. So it was only naturally that we created a vegan, meatless version of my favorite take out dish! I aimed to make this as easy as possible and debated skipping the frying step but it just felt essential to me. We start by tossing the cauliflower florets in a bit of oil and then adding in cornstarch and salt & pepper to the mix. That is then fried briefly in some oil before being added to a baking sheet. The sauce is whisked together and poured over the cauliflower that is then baked in the oven for about 15 minutes. 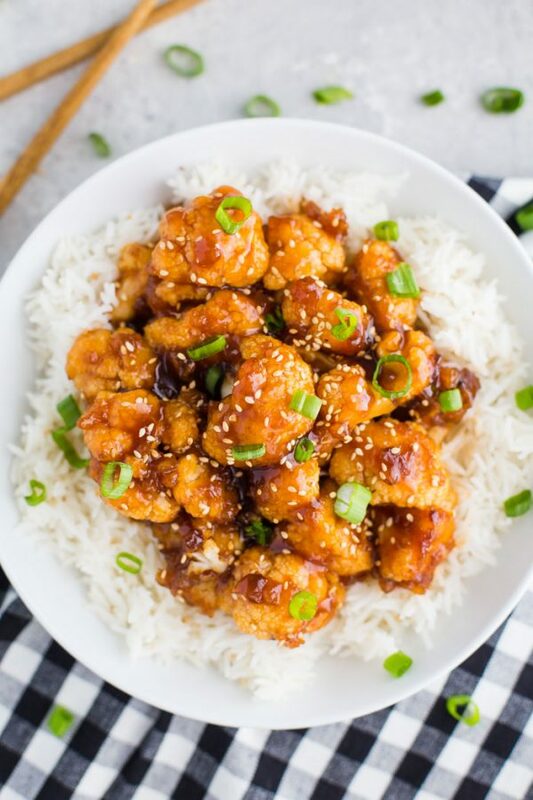 I always always serve mine with some good white rice from my instant pot because I’m weirdly a little obsessed with white rice! That’s all I have for you on this Monday morning. I hope you have a GREAT WEEK! Pre-heat your oven to 425 degrees F and lightly grease a baking sheet. 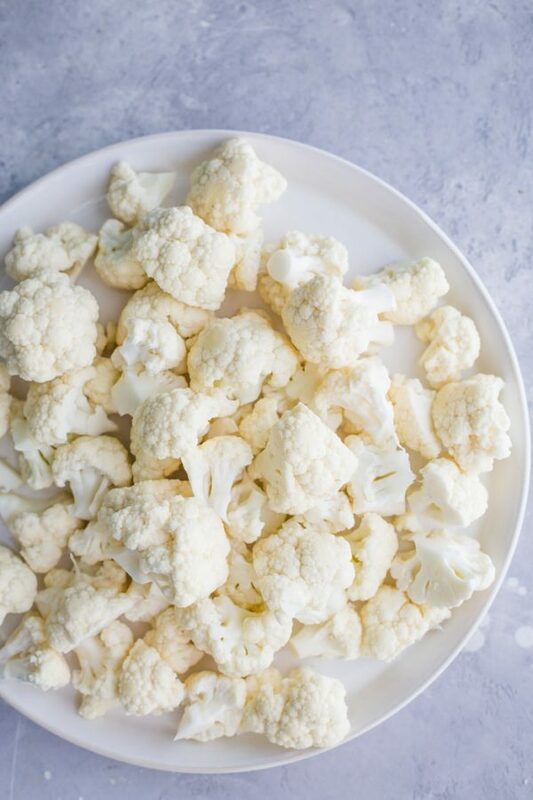 Place the cauliflower in a large plastic baggie (you can also do this in a large bowl) and toss in the salt, pepper, and 3 tablespoons of the oil. Give it a good shake to coat the cauliflower and then add in the 1/2 cup of cornstarch. Toss again until covered in the cornstarch. Heat 1/3 cup of oil in a large pot over medium high heat. Once hot, add in the cauliflower and fry for about 5 minutes, tossing to cook on all sides. Once done, place on the baking sheet. Make the sauce by whisking together the apple cider vinegar, ketchup, soy sauce, maple syrup, garlic salt, and corn starch + water. Pour the sauce over top of the cauliflower and toss. Bake for 10-15 minutes or until the cauliflower is just starting to get crispy. 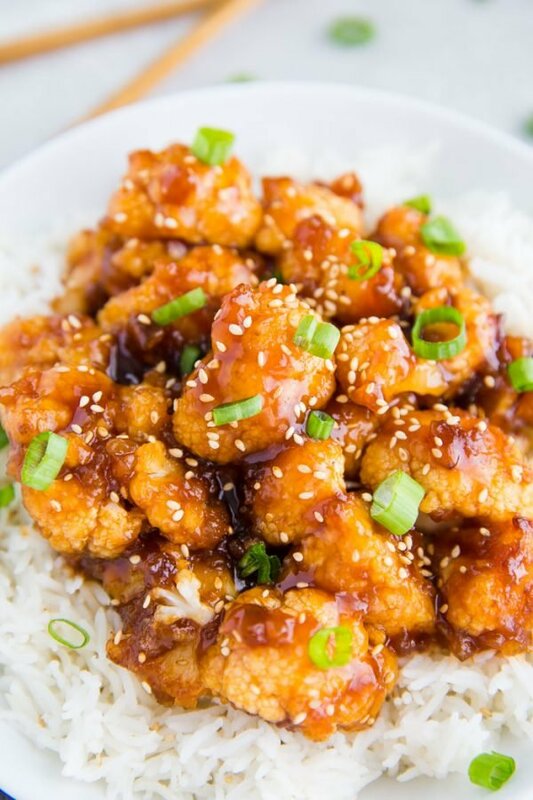 Serve with sesame seeds, green onion, and ENJOY! Oh my gosh this cauliflower looks SO good! Your trip sounds pretty epic too! Eat plenty of pasta, gelato, and French croissants for me…I’ll live vicariously through you on your trip, ha!! Why do you fry the cauliflower if you can boil it or steam it? Is there any difference? I have found that in America it is very popular to have a cauliflower really hard, but I don’t understand it. Even if we do “schnitzel” here in central Europe, we first boil it (water, a little bit od milk, salt, nutmeg) and then fry/bake it. This recipe looks amazing! It is simple but the dish is delicious, thank you so much for sharing it! I am wondering whether I could freeze it…and if so, would it loose its flavor? Or is this not a freezer-friendly recipe? Unfortunately, I’ve never tried to freeze this so I can’t say. So sorry! Please let me know if you end up trying it out though! I’ve been looking for a recipe like this and am excited to try it!! It looks delicious. Your photos are beautiful! Are there details missing in between steps 4 and 5? I prepared as written but the sweet n sour sauce was pretty much like water when i poured it over the cauliflower. Should i have heated the sweet n sour sauce to activate the thickening of the cornstarch?